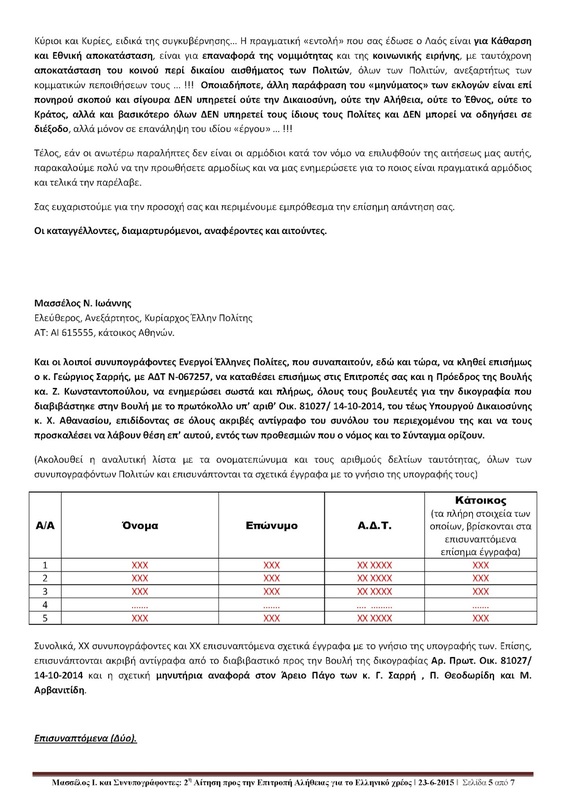 Η Ελλάδα βρίσκεται σήμερα, τον Ιούνιο του 2015, μπροστά σε ένα σταυροδρόμι. Έχει να διαλέξει ανάμεσα στο να συνεχίσει τα αποτυχημένα προγράμματα μακροοικονομικής προσαρμογής που της επέβαλαν οι δανειστές και στο να προχωρήσει, σπάζοντας τα δεσμά του χρέους, σε μια αληθινή αλλαγή. Πέντε χρόνια αφότου ξεκίνησαν τα προγράμματα οικονομικής προσαρμογής, η χώρα παραμένει βυθισμένη σε κρίση –οικονομική και κοινωνική, οικολογική και δημοκρατική. Το μαύρο κουτί του χρέους μένει σφραγισμένο, και μέχρι πρότινος κανένας επίσημος φορέας, ελληνικός ή ξένος, δεν επεδίωξε να φέρει στο φως την αλήθεια για το πώς και γιατί η χώρα καθυποτάχθηκε στο καθεστώς της Τρόικας. Το χρέος, στο όνομα του οποίου ισοπεδώθηκαν τα πάντα, παραμένει ο γνώμονας της νεοφιλελεύθερης προσαρμογής, που οδήγησε στη βαθύτερη και πιο μακρόχρονη ύφεση σε ευρωπαϊκό έδαφος και σε καιρό ειρήνης. Το Ευρωπαϊκό Ταμείο Χρηματοπιστωτικής Σταθερότητας παρέχει δάνεια χωρίς μετρητά (cash-less loans) τα οποία πρέπει να θεωρηθούν παράνομα, επειδή παραβιάζουν όχι μόνον το Άρθρο 122(2) της Συνθήκης για τη Λειτουργία της Ευρωπαϊκής Ένωσης (ΣΛΕΕ/TFEU), αλλά και πολλά κοινωνικά και οικονομικά δικαιώματα, καθώς και πολιτικές ελευθερίες. 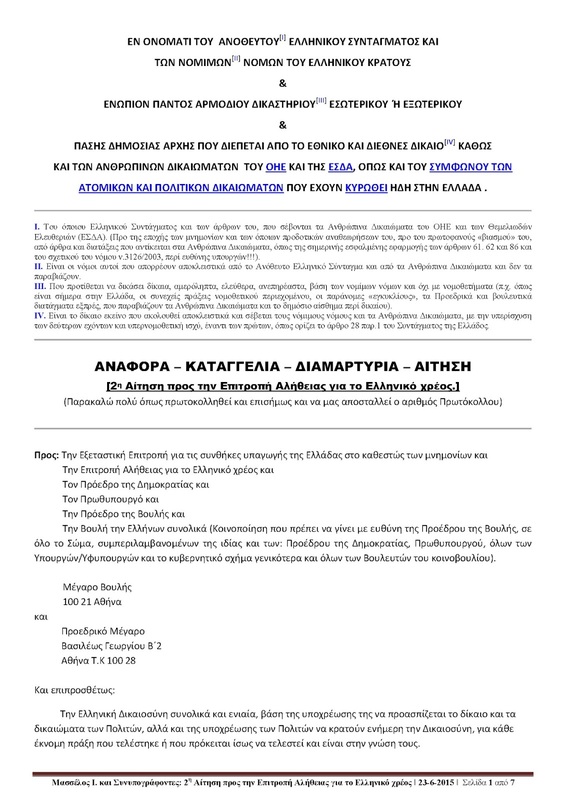 Περαιτέρω, η Συμφωνία Πλαίσιο (Framework Agreement) του ΕΤΧΣ, του 2010, καθώς και η Κύρια Σύμβαση Χρηματοδοτικής Διευκόλυνσης (Master Financial Assistance Agreement) του 2012, περιλαμβάνουν πολλαπλούς καταχρηστικούς όρους, οι οποίοι αποκαλύπτουν σαφώς αθέμιτη συμπεριφορά από την πλευρά του δανειστή. Το ΕΤΧΣ παραβιάζει επίσης με τη δράση του τις δημοκρατικές αρχές, γεγονός που καθιστά αυτά τα συγκεκριμένα χρέη αθέμιτα και επονείδιστα. 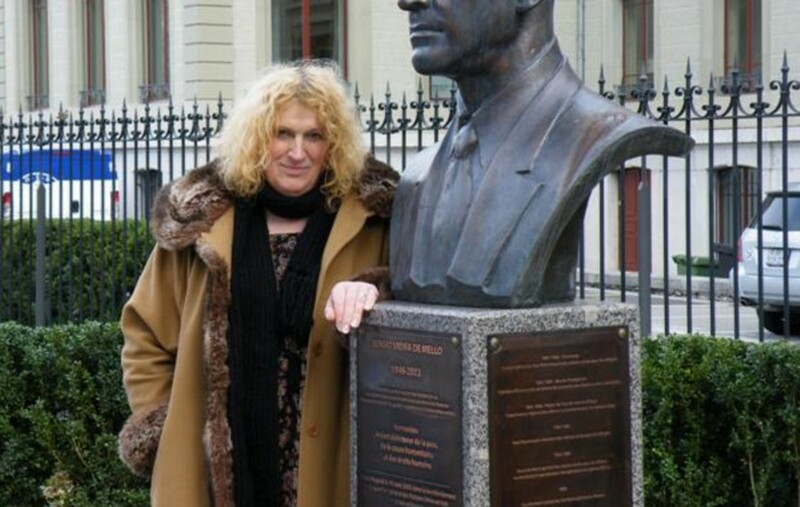 At the June, the 1st of 2015, the human rights activist Sarah Luzia Hassel-Reusing has filed a submission to the debt truth commission of the Greek Parliament. 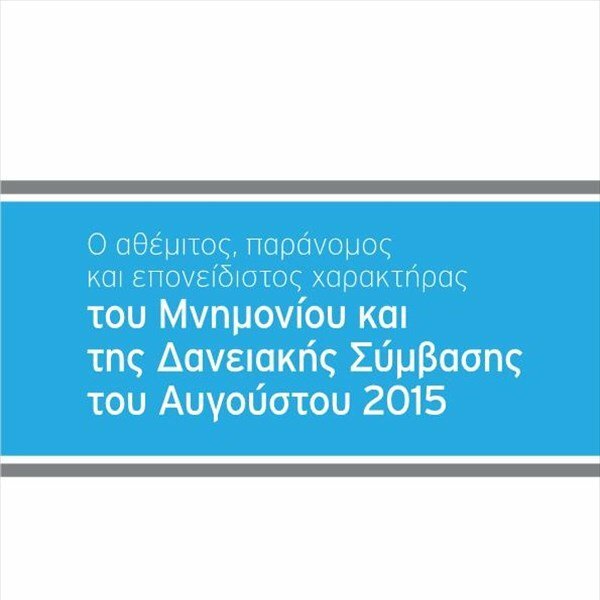 It explains comprehensively grave irregularities regarding the Greek debts and conditions connected to them. And it makes concrete recommendations, how to calculate the illegitimate and odious parts of the debts. The Greek population has a right to get to know about those irregularities. 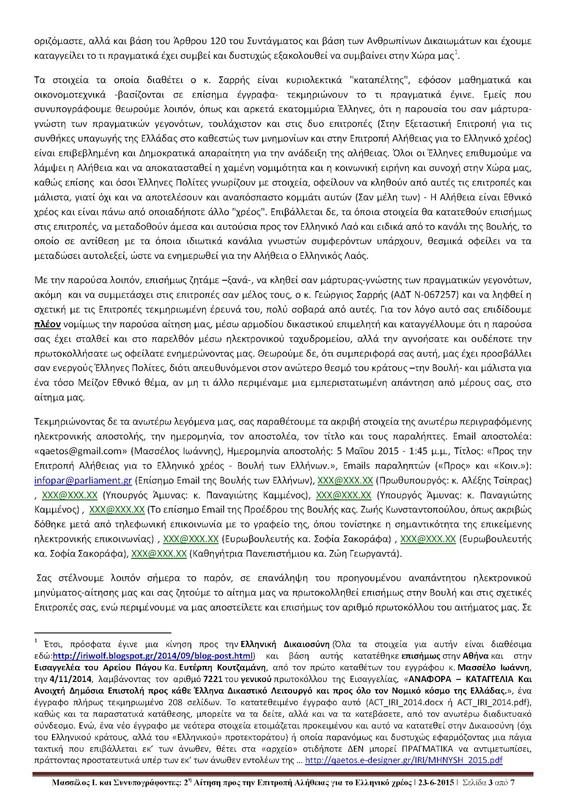 Even though that submission focuses on the features relevant for the illegitimateness and the odiousness of debts, it will also contribute to a deeper understanding, for which purposes the health and the lives of so many innocent Greek people are being sacrificed. Mrs. Zoe Konstantopoulou, the President of the Greek Parliament, has been completely right, when she has regarded the partly destruction of the Greek population to be a crime against humanity (art. 7 Roman Statute); the people responsible for the illegitimate and odious conditions imposed on Greece are just more geographically and institutionally distributed, and more of them from the private sector, than it might seem. They provenly do it to enable a huge shift of money from the states and from the citizens to the banks, while pretending to rescue Greece or the currency euro. Banks have deliberately withheld the information, that giral money is created out of nothing in the moment of the granting of a loan by a bank, and it is deleted, when the loan is paid back. What banks have known for centuries, has been empirically proven by economical science in September 2014. This shows very clearly, that every bank is replacable, that there are no „systemic“ „too big to fail“ banks at all. And what an obvious difference to the value of the lifes of human beings and of their birth and death. Moreover, the main aim is to force the countries of the eurozone into the state insolvency procedure of the ESM, in order to put through the privatization of their public utilities, resources, and particularly of their administrations, their courts, and their institutions for inner and outer security. Already the Lisbon Treaty has inserted the prescriptions demanding the functional privatization of the public utilities („services of general economic interest“, art. 14 TFEU) and of the sovereign institutions („non-economic services of general interest“, art. 2 of protocol 26 to TEU and TFEU), the latter of which, however, has been prohibited by the Lisbon Judgement of the German Constitutional Court of the 30.06.2009. The ESM, but also so-called „free trade“ treaties (TTIP, TISA, and CETA) are the next tools to enforce that revolutionary change of the type of state of the EU member states into the so-called „guarantueeing state“, where the sovereign power is in the hands of private corporations, a de-facto private state, with government and parliament remaining as the last elected facades. Prof. Dr. Andreas Voßkuhle, the President of the German Constitutional Court, has already in 2002 provenly lobbied for the functional privatization of parts of the sovereign institutions of the states; as he has pointed out in thesis 12 of his then speech before the VVDStRL, giving sovereign powers to private actors is completely unconstitutional, and it deprives the countries of their control over the execution of their sovereign power. And in September 2015, even a universal state insolvency procedure is going to be concluded at the UN level. 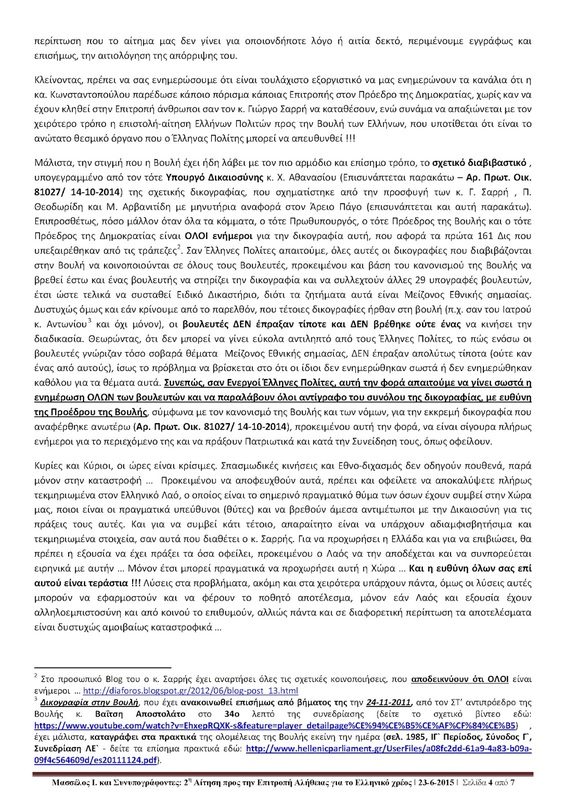 As shown in the submission to the Greek debt truth commission, it is rather going to become a kind of ESM at the world level, for the functional privatization of the public utilities and the sovereign institutions of overly indebted states world-wide, than a mechanism for a fair debt reduction at the standard of the human rights. The political cartel of Bilderberg has had, for decades, a significant influence particularly on the EU Commission, but also on other international organizations and bodies and on national governments. The first chairman of Bilderberg (Prince Bernhard of the Netherlands) and the first President of the EU Commission (Walter Hallstein) both had been lobbyists of the IG Farben before – showing a link right from the beginning with a view to systematic corporate undermining of democracy in Europe via the EU Commmission. Mr. Jose Manuel Barroso has been the President of the EU Commission, when the mechanisms of the European Financing Mechanism („Greece Support“, EFSM, EFSF, and ESM) and of the EU Economic Government (tightened Stability and Growth Pact, Imbalance Procedure, and Budgetary Surveillance) have been created – all under the pretext of the safeguarding of the currency euro. He has been several times at the Bilderberg conference during his presidency. Since 2015, he is in the steering committee of Bilderberg. The current President of the EU Commission, Jean-Claude Juncker, has been connected with Bilderberg for many years. The Bilderberg conference 2011 has dealt with the ESM and been attended by, i. a., the then President of the European Council and by the then Financial Ministers of Greece, Great Britain, and Italy. The Bilderberg conference 2015 has had Greece on its agenda with, i. a., Mr. Jeroen Dijsselbloem (President of the Eurogroup), Mr. Benoît Coeuré (board member of the ECB), and Mr. Karel de Gucht (former EU Trade Commissioner); just look at the behaviour of those people regarding the subjugation of Greece under the ESM and regarding so-called „free trade“. The gravest irregularity, however, is the systematic outflanking of the human rights in the course of the drafting and the decisions on the imposed conditions, and that the strictness of the imposed austerity measures have been explicitely wanted as strict as in the „practice“ respectively as the „modalities“ of the IMF (Ecofin Council, 09.05.2010, file number SN 2564/1/10) – even though any serious Financial Minister must have known at least since 1991, that UNICEF has accused IMF and World Bank to be responsible for the death of up to seven million children below the age of five years world-wide alone in the years 1982 – 1991 (p. 12 of the foreword of the economist and former IMF employee Davison Budhoo in „Genug ist Genug“, published via Heinrich Böll Foundation in 1991). The civil population of Greece has been deliberately and strategically targeted with shocks. The referendum has been used to create a symbol of hope, and then to destroy it very fast, in order to cause confusion and a feeling of frustration and hopelessness. That is where they want the have the Greek people. And the subjugation under the ESM is by far more drastic than the EFSF conditions, which had been rejected by the referendum. The actors see the people as chesspieces on their geostragical playground. As Prof. Joseph Stiglitz has explained it in 2001 regarding the IMF, unbearable austerity measures are also used to create riots as a means to put through privatization far below market prices. I recommend you to remain peaceful centered in your heart. The solidarity clause (art. 222 of the Treaty on the Functioning of the European Union, TFEU) and the prescriptions for its application (file number 2014/415/EU) have been created to violently quell down protests with the joint use of the armies of the EU member states. The deliberation of the then President of the EU Commission, Mr. Jose Manuel Barroso regarding a possible vanishing of democracy at Greece, Portugal, and Spain, if these countries failed to manage the crisis (Daily Mail article „Nightmare vision for Europe as EU chief warns ‘democracy could disappear’ in Greece, Spain, and Portugal“ of the 15.06.2010) needs to be taken serious in this context. Please listen closely. The following information is crucial. What everyone of you can do, is to inform many people of the following submission, and to discuss it with friends. The next necessary steps for the peaceful restoration of the order of the Greek Constitution and of the order of the universal human rights in Greece and in the other EU member countries will then become visible. The peoples of the countries of Europe including the Greeks need a transformation to humanity rather than a revolution. They need to resolutely, centered in their hearts, without any fear or hate, with the unshakable will to rebuild a human society. herewith I submit to you some crucial pieces of information regarding grave irregularities around the Greek debt. 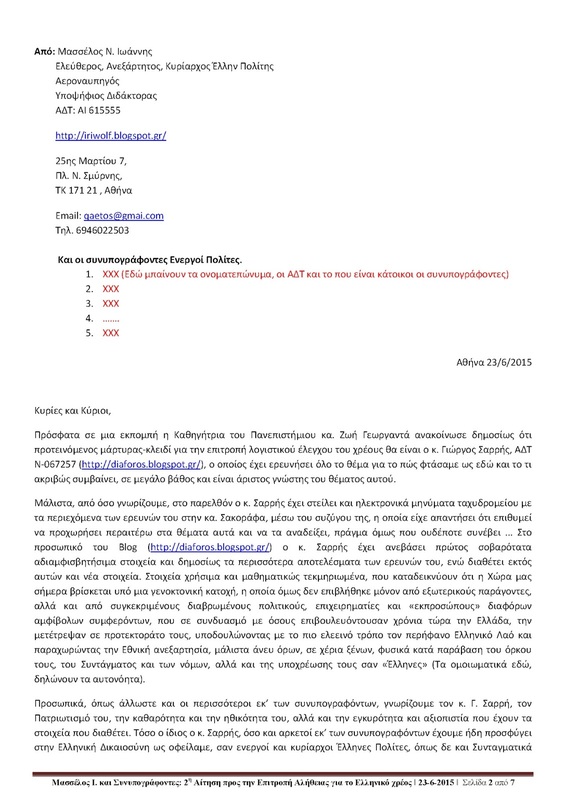 I have learned from the speeches by Mrs. Zoe Konstantopoulou, the President of the Greek national Parliament, after the conclusion to set up the Truth Commission and in April 2015 before the Italian national Parliament, as well as from the Avgi interview with Mr. Eric Toussaint, the scientific coordinator of the Truth Commission, that its aim is to investigate irregularities around the Greek public debt, and to come to conclusions, which parts of it is odious, illegitimate, illegal, or unsustainable. According to art. 1 par. 2 Basic Law, the German people confesses, because of the inviolable human dignity, to invulnerable and inalienable human rights as the basis of every human community, of peace, and of justice in the world. That prescription, which is, as a part of art. 1 Basic Law, protected by the eternity guarantuee (art. 79 par. 3 Basic Law), is a connection to the universal human rights, and it obliges all Germans to stand up for peace and for the universal human rights. A legally binding obligation to peace and human rights for all Germans has been a decisive precondition by the then US Foreign Minister James F. Byrnes in his famous speech in Stuttgart, in order to allow the USA to accept, that Germany could get to wealth again. “Δεδομένου ότι το χρέος και όλες οι δανεια- κές συμβάσεις μεταξύ 2010-2014 αποδείχθη- καν απεχθείς, παράνομες και αθέμιτες, οποια- δήποτε μεταγενέστερη δανειακή σύμβαση που στηρίζεται σε αυτές (αγνοώντας τον παράνομο χαρακτήρα τους) είναι και αυτή απεχθής, παρά- νομη και αθέμιτη”αναφέρεται μεταξύ άλλων.